The Trump effect refers to events and trends that have occurred due to the election or influence of Donald Trump as United States President. 4 Effect on token "conservatives"
The Trump effect includes voluntary actions by American companies to make America great again by not moving manufacturing jobs to other countries, after Donald Trump championed this issue in his successful campaign for president in 2016. Despite expectations that Trump's election victory would cause the markets to plunge, the Dow Jones Industrial Average actually performed very strongly, closing at the highest level it had ever reached in history after the second day. It is rare for the stock market to rise immediately after a U.S. presidential election regardless of the winner. The stock market had its best week in five years due to the optimism of a Trump presidency. Trump was very busy in his first week and showed he was serious about his campaign promises. This caused the stock market to increase, and the Dow Jones passed 20,000 points for the first time in its history. It had been only 42 days since the Dow Jones passed 19,000 points, making it the second-fastest 1,000 point move of the Dow in its history. On March 1, 2017, the day after Trump made his first address to a joint-session of Congress, the stock market rose dramatically again, with the Dow Jones passing the 21,000 mark for the first time in history. The stock market had one of the best performances in the first 100 days of Trump's presidency compared to the first 100 days of previous presidents in U.S. history. On June 1, 2017, the same day President Trump announced his decision to withdraw from the Paris Climate Agreement, and the day after, the stock market rose strongly, mainly due to news of increased economic growth. Of course, the stock market did not see only growth during the Trump Administration; on May 17, 2017, for example, the Dow Jones fell 372 points (1.78%) due to the fallout from the James Comey controversy. The Trump effect includes an overwhelming loss in trust by the public in the mainstream media, with the vast majority of people recognizing now that the media frequently lies to the public and is thoroughly tainted by liberal bias. Trump and his actions were able to more clearly delineate between conservatives and token conservatives – liberals posing as conservatives. When Trump became the presumptive nominee, some registered Republicans left the party. Numerous liberal and establishment Republicans chose not to vote for Trump in the general election. Trump's nomination also reportedly deepened the divide between the GOP establishment and the base. David Frum voted for the far-left Hillary Clinton over conservative Donald Trump in the 2016 presidential election and later called for President Trump to resign. In May 2017, Ross Douthat called for President Trump's impeachment, but because of any "high crimes and misdemeanors," which Douthat admitted Trump did not commit, but because Trump was supposedly unfit to serve. The same month, George Will stated that Donald Trump supporters were "scowling primitives" who "hijacked" the conservative movement. In July 2017, Joe Scarborough showed how liberal he had become by finally leaving the GOP. Bret Stephens stated that "the party of Donald Trump" is related to "exclusion, fear, and bigotry", and that conservatives must "admire" the elites, who are "educated" and care about "culture" and the "cultivation of the human soul." He also stated that "real Americans are screwing up America" and should deport themselves. Despite claiming to be "center-right", Jennifer Rubin shows herself to be a leftist in devoting most, if not all, her commentary articles on bashing Trump and pro-Trump anchors on Fox News. Evan McMullin's behavior and anti-Trump attacks (coming from someone claiming to be a conservative alternative to Trump), as well as his refusal to give Trump a chance to show himself to be a conservative president, became so outrageous that even other anti-Trumpers who endorsed him, such as Erick Erickson, turned away from him. The most notable instance of a Democrat becoming a Republican due to President Trump was West Virginia Governor Jim Justice. Illegal immigration declined dramatically after Trump took office. 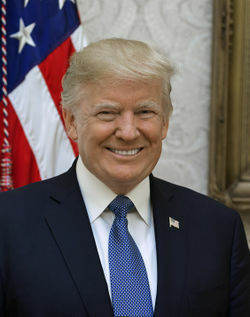 According to data released early in Trump's presidency, illegal border crossings decreased by 40% in the first month of Trump's presidency – a remarkable achievement, considering that illegal immigration usually increases by 10 to 20% in January and February. In March, illegal immigration had fallen by over 60%. By Trump's 100th day in office, levels were reported to have fallen by 73%. The declining trend of border apprehensions (an indicator of the level of illegal immigration) continued through May. It was reported in April that illegal immigration levels had fallen to the lowest point in 17 years. It was reported in May that the number of child illegal immigrants entering the nation monthly had fallen below 1,000, the first time in several years, and that total illegal immigration levels had fallen by 76%. In six months, the illegal immigration of Haitians, specifically, into the U.S. declined by 97%. Although not solely due to President Trump, illegal immigration from Cuba dropped dramatically in the beginning of Trump's presidency. Illegal immigration dropped so much that U.S. Customs and Border Protection was able to close one of their temporary holding facilities. As another illustration, a non-profit shelter organization for illegal immigrants, Southwest Key Programs, was forced to lay off nearly 1,000 of its employees due to the drop. The drop in illegal immigration was probably due to the Trump effect and tougher illegal immigration and deportation policies by the Homeland Security Department. Illegal immigration levels rose in June 2017, but they were still much lower than the previous year and at a six-year low. The Trump effect also includes actions by foreign dictators to stop lying to the world, as when Cuba finally admitted that Fidel Castro was dead after ten years of denying it. The communist dictator did this just before President-elect Trump was to receive a briefing by the Obama Administration, which had long known that Fidel was dead as demonstrated by how Obama did not even mention, let alone meet, Fidel during Obama's trip to Cuba in early 2016. President Trump strongly urged the other NATO members to increase their defense spending in order to meet their spending pledges. In late-June 2017, it was reported that Europe's NATO countries would increase their defense spending at the fastest pace in three years. ↑ 1.0 1.1 La Monica, Paul R. (November 10, 2016). The 'yuge' Donald Trump market rally continues. CNN Money. Retrieved November 10, 2016. ↑ Decambre, Mark (January 25, 2017). Dow clambers above 20,000 — marks 2nd-fastest run to a milestone in history. MarketWatch. Retrieved May 18, 2017. Carney, John (May 1, 2017). Donald Trump’s First 100 Days: Stock Market’s Best-Ever Expansionary Rally. Breitbart News. Retrieved May 1, 2017. Craig, Victoria (April 28, 2017). Trump's First 100 Days Gets an 'A' from Wall Street, 'B' from Main. Fox Business. Retrieved May 16, 2017. Egan, Matt (April 28, 2017). Trump rally is 2nd best since JFK. CNN Money. Retrieved May 16, 2017. Domm, Patti (April 28, 2017). Trump helped make stock market a winner in first 100 days, but the next 100 could be harder. CNBC. Retrieved May 16, 2017. ↑ Witkowski, Wallace; Mahmudova, Anora (June 2, 2017). Stock market closes at records as tech leads gains. MarketWatch. Retrieved June 3, 2017. Mikolajczak, Chuck (June 1, 2017). Wall Street rises as data points to accelerating economy. Reuters. Retrieved June 3, 2017. Owusu, Tony (June 1, 2017). Markets Close at Record High Following Trump's Paris Climate Accord Announcement. TheStreet. Retrieved June 3, 2017. Wall Street hits record highs as economy seen accelerating. Rocco, Metthew (June 1, 2017). Trump's move to exit Paris climate pact hits oil. Fox Business. Retrieved June 3, 2017. Campos, Rodrigo; Groom, Nichola (June 1, 2017). U.S. coal stocks fall; exit from climate deal may hurt, not help. Reuters. Retrieved June 3, 2017. ↑ Craig, Victoria (May 17, 2017). Trump-Comey Turmoil Socks Wall Street, Stocks See Worst Day in Eight Months. Fox Business. Retrieved May 17, 2017. Shalby, Colleen (May 4, 2016). Some Republicans burn voter registration cards, leave GOP after Trump's win in Indiana. Los Angeles Times. Retrieved June 5, 2017. Tatum, Sophie (May 4, 2017). Some Republicans say they're breaking away from the party now that Donald Trump is presumptive nominee. CNN. Retrieved June 5, 2017. Jeffries, Tara (May 4, 2017). Republicans burn voter registration cards on social media in protest of Trump. PBS News. Retrieved June 5, 2017. A Trump challenge: uniting bitter Republicans. Breitbart News. May 4, 2017. Retrieved June 5, 2017. ↑ Graham, David A. (November 6, 2016). Which Republicans Oppose Donald Trump? A Cheat Sheet. The Atlantic. Retrieved June 5, 2017. ↑ Stokols, Eli (May 8, 2017). Donald Trump breaks the GOP. Politico. Retrieved June 5, 2017. ↑ Revesz, Rachael (November 3, 2017). George W Bush’s speechwriter says he voted for Hillary Clinton. The Independent. Retrieved May 19, 2017. ↑ David Frum. Twitter. May 15, 2017. Retrieved May 19, 2017. ↑ Pollak, Joel B. (May 17, 2017). New York Times’ ‘Conservative’ Columnist Calls for Trump to be Ousted. Breitbart News. Retrieved May 17, 2017. ↑ Ernst, Douglas (June 1, 2017). George Will blasts ‘scowling primitives’ for hijacking conservative movement. The Washington Times. Retrieved June 1, 2017. Siegel, Josh (July 11, 2017). Joe Scarborough announces he is leaving Republican Party. Washington Examiner. Retrieved July 11, 2017. Joe Scarborough, host of ‘Morning Joe,’ explains move to leave GOP. The Washington Times. July 12, 2017. Retrieved July 12, 2017. Hanchett, Ian (July 11, 2017). Scarborough: ‘I’m Not Going To Be a Republican Anymore’. Breitbart News. Retrieved July 12, 2017. Chumley, Cheryl M. (July 12, 2017). Joe Scarborough — gasp! — exiting GOP, stage right. The Washington Times. Retrieved July 12, 2017. ↑ 22.0 22.1 Lee, Tony (July 5, 2017). ‘Never Trumper’ Bret Stephens: POTUS Supporters ‘Idiots’ & Bigots, Should ‘Admire’ Elites. Breitbart News. Retrieved July 6, 2017. ↑ Dulis, Ezra (June 28, 2017). Erick Erickson’s The Resurgent Turns Against Evan McMullin: A Tragedy in 10 Headlines. Breitbart News. Retrieved June 29, 2017. ↑ Chumley, Cheryl K. (August 4, 2017). Jim Justice swap of ‘D’ to ‘R’ shows Trump Effect not a fluke. The Washington Times. Retrieved August 4, 2017. ↑ Gómez, Serafin; Doocy, Peter; Darrah, Nicole (August 3, 2017). West Virginia's Democratic governor announces switch to Republican party. Fox News. Retrieved August 4, 2017. ↑ 26.0 26.1 Lajeunesse, William; Prabucki, Laura (May 11, 2017). Trump's tough immigration rhetoric slows illegal border crossings: 'We're at a trickle'. Fox News. Retrieved May 11, 2017. ↑ Bogan, Ray (June 9, 2017). Border Patrol arrests in 2017 break historical trend. Fox News. Retrieved June 10, 2017. ↑ Illegal border crossings decrease by 40 percent in Trump's first month, report says. Fox News. March 9, 2017. Retrieved March 31, 2017. ↑ Illegal border crossings from Mexico down 40%. Breitbart News. March 9, 2017. Retrieved March 31, 2017. U.S. Illegal Immigration Plunges on Trump Crackdown. Breitbart News. April 6, 2017. Retrieved April 6, 2017. Statement from the Press Secretary on the Decline in Southwest Border Apprehensions. whitehouse.gov. April 5, 2017. Retrieved April 5, 2017. Churchwell, Logan (April 4, 2017). Illegal Immigration Fell 67 Percent under Trump, Says Fmr. Border Chief. Breitbart News. Retrieved April 5, 2017. ↑ Nolan, Lucas (April 29, 2017). Trump: ‘Illegal Immigration Down by Unprecedented 73%’. Breitbart News. Retrieved April 30, 2017. ↑ 32.0 32.1 Valverde, Miriam (April 25, 2017). Is illegal immigration the lowest in 17 years, as Trump said? PolitiFact. Retrieved April 30, 2017. Cohen, Kelly (June 8, 2017). Border patrol data: Arrests at US-Mexico border on steady decline. Washington Examiner. Retrieved June 8, 2017. Dinan, Stephen (June 11, 2017). Illegal immigration across southwest border increased during May, says Homeland Security. The Washington Times. Retrieved June 11, 2017. ↑ L.A. Times: Southwest Border Crossings at ‘Lowest Point in at Least 17 Years’. Breitbart News. April 10, 2017. Retrieved April 11, 2017. ↑ Price, Bob (May 12, 2017). Mexican Border Apprehensions Hit 17-year Low. Breitbart News. Retrieved May 12, 2017. ↑ Dinan, Stephen; Noble, Andrea (May 9, 2017). Trump’s immigration enforcement helps slow illegal border crossings by 76%. The Washington Times. Retrieved May 9, 2017. ↑ Dinan, Stephen (April 16, 2017). Haitians get word of Trump crackdown, slow flow to border by 97%. The Washington Times. Retrieved April 20, 2017. ↑ Saavedra, Ryan (May 12, 2017). Cuban Migration Plummets to Zero in April. Breitbart News. Retrieved May 12, 2017. ↑ Price, Bob (February 15, 2017). Drop in Trump Era Border Crossings Shutters Detention Center. Breitbart News. Retrieved March 31, 2017. ↑ Price, Bob (May 22, 2017). Migrant Shelter Lays Off 1,000 after Border Crossings Drop. Breitbart News. Retrieved May 22, 2017. ↑ Sessions: Border crossings down 60 percent due to 'Trump's strong leadership'. Fox News. March 30, 2017. Retrieved March 31, 2017. ↑ Brown, Ben (April 12, 2017). Border Patrol Union President: Illegal Immigration Decline ‘Strictly’ Due to Trump. Fox Business. Retrieved April 20, 2017. ↑ Gibson, Jake (May 9, 2017). Border apprehensions plummet as DHS touts enforcement push. Fox News. May 9, 2017. Retrieved May 9, 2017. ↑ Kasperowicz, Pete (May 23, 2017). DHS: 'Historic shift' in border crossings since Trump's executive order. Washington Examiner. Retrieved June 23, 2017. Bedard, Paul (July 7, 2017). 53% drop in arrests of illegals at Southwest border crossings, 6-year low. Washington Examiner. Retrieved July 7, 2017. Dinan, Stephen (July 7, 2017). Illegal immigration spikes along U.S.-Mexico border. The Washington Times. Retrieved July 7, 2017. Price, Bob (July 8, 2017). Border Crossings at Historic Lows, Up from Last Month. Breitbart News. Retrieved July 8, 2017. Price, Bob (July 10, 2017). Border Apprehension of Families, Minors Increase Substantially in June. Breitbart News. Retrieved July 10, 2017. Starr, Penny (June 30, 2017). Winning: NATO Heeds Trump’s Call to Make Member Nations Pay Fair Share. Breitbart News. Retrieved July 4, 2017. Emmott, Robin (June 28, 2017). Trump effect? Europe's defense spending to rise faster in 2017. Reuters. Retrieved July 4, 2017. Banks, Martin (June 30, 2017). Defense spending increased 'significantly' among NATO allies. Defense News. Retrieved July 4, 2017. This page was last modified on 9 April 2019, at 18:24.